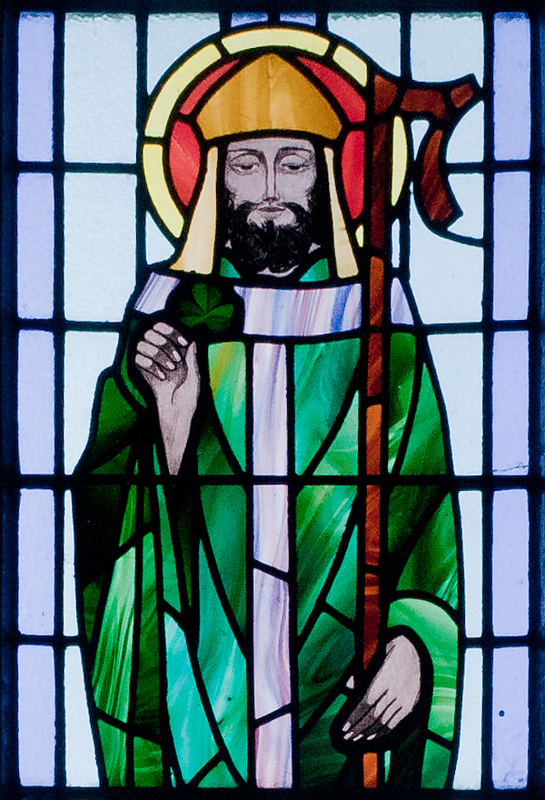 Detail of stained glass window depicting St. Patrick. “The Rose does not preen herself to catch my eye. She blooms because she blooms. “We need saints without cassocks, without veils - we need saints with jeans and tennis shoes. We need saints that go to the movies that listen to music, that hang out with their friends (...) We need saints that drink Coca-Cola, that eat hot dogs, that surf the internet and that listen to their iPods. We need saints that love the Eucharist, that are not afraid or embarrassed to eat a pizza or drink a beer with their friends. We need saints who love the movies, dance, sports, theatre. We need saints that are open, sociable, normal, happy companions. We need saints who are in this world and who know how to enjoy the best in this world without being callous or mundane. In the USA, Ireland and many other countries, tomorrow is St. Patrick's Day, which, oddly enough, is celebrated by drinking beer. Wikipedia records that this practice occurs because the restrictions of Lent, a Christian pre-Easter period of becoming closer to God, are suspended for the day. Saintliness can have a religious definition and/or a metaphorical one. If you say "He's a saint" or "They're not saints" you are talking about extreme goodness. Perhaps you celebrate this day, have stories of Saints and miracles, or know a saintly person? In a new poem, celebrate a Saint or a saint who is meaningful to you. If only as a statistician. Dragnea, Stuart Friebert, and Adriana Varga. Copyright © 1991 by Oberlin College Press. Not sure if my little helper is quite a saint although she is partial to Guinness - thank you for the prompt and happy St Patricks day to all who celebrate it! Good to see you, Jae Rose! Good Morning, Poets United! I've been absent quite a bit lately, tending to a manuscript that I've been working on during 8 weeks as writer in residence at a Quaker study center. I'm taking home new ways to concentrate and to stay on track. If you are interested, I wrote a few blog posts on the experience over at http://susan60.blogspot.com/--actually I wrote an average of 2 a week! My poem production went down accordingly. I want to thank Sumana, especially, for taking on extra prompts and inspiring us all. PS: DEBORAH PAREDEZ, poet of the Triolet, may visit. I love the poem-plea for one who will listen and teach us "to steward this world." I hope it's not too late. Thank you for the prompt, although it took me to very melancholy places. Some of us reveal where saintliness is and some where it is not--both are important, I think. I fear I ducked that problem completely. I may have to produce another poem! Thank you Susan for wonderful inspiration. I look forward to your joyous greeting every time. Thank you! Wonderful of you to share all that great information. Cheers! Thank you. Are you just visiting? Will we have a poem later? Good to see you, Gillena. I'm on my way over. Not sure, if my poem fits this week's prompt, but it deserves mentioning. Oh yes it does! Thank you. Thanks for the prompt Susan. It took me a while, but I finally thought of something to write. Have a good rest of the week. You are very welcome. I'm glad you persisted. Good stuff! Saint or sinner I think we are all a bit of both. Perhaps. I wonder if there are contemporary names for any of the points along the spectrum of these extremes? Wonderful Prompt. Thanks for posting.. Welcome! Thanks for posting. Don't forget to come around an visit the rest of us. Great prompt! Loved writing on it...thank you! Thank you, Amit. For some reason this comment came up twice, so I'll erase one. Eager to read the responses to this interesting motif. You are very welcome, Hannah.